Everybody who owns Watch Dogs has spent a bit of time playing it like it’s GTA. Whether the UI’s to blame or the binary familiarity of hopping in and out of cars, it’s all to easy to fall back on long-perfected cop-shaking routines and machine gun solutions. WatchDogsIV suggests we do it the other way around. The work of three modders, it infuses Liberty City with the closed-circuit paranoia, hacking mechanics and long, leather coats of future Chicago. YouTuber Yeardley Diamond “initialised” the project just weeks ago, implementing Watch Dogs’ line-of-sight camera-swapping mechanic. 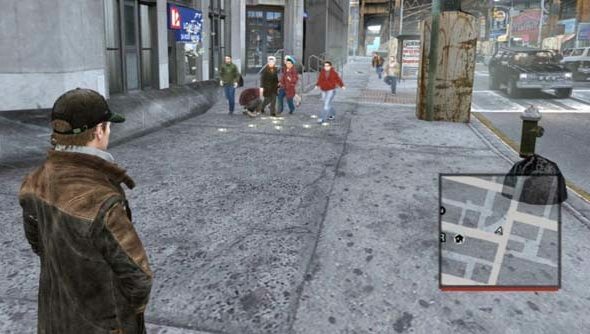 His project has since been picked up by fellow modder JulioNIB who, with the help of animator Ac.amir, has recreated Watch Dogs’ most recognisable features in the six-year-old GTA IV. Thanks to Ac.amir, Aiden Pearce has made the leap with his cap, perma-grimace and shoe-gazing gait intact. Stuttering lines trail from our protagonist to potential hacking targets, in almost perfect mimicry of Ubisoft Montreal’s glitchtastic art style. But it’s not just surveillance chic that WatchDogsIV pulls from its namesake. In this Liberty City, it’s possible to trip alarms, raise bollards, or change traffic lights – and it turns out the resulting pile-ups are much more entertaining in GTA. Pop machines spill their contents at your will; cash machines splurge notes, bringing in swarms of brawling NPCs. The genius of the mod is that it makes use of the emergent systems already existent but often dormant in GTA IV. All in all, it looks like a brilliant way to rediscover Liberty City – either on CCTV or from the top of a train that’ll stop and start on your command. Do you think you might give it a go?